Ashbury Precision Ordnance is making great strides in the innovation of high quality bolt action rifles. Their latest release is the SABER SX Short Action Receiver, which is their first octagonal bolt action receiver. The receiver can be utilized in conjunction with their SABER-FORSST Modular Rifle Chassis System with the need for further modification. We have provided their full press release below giving the full skinny on their new receiver. 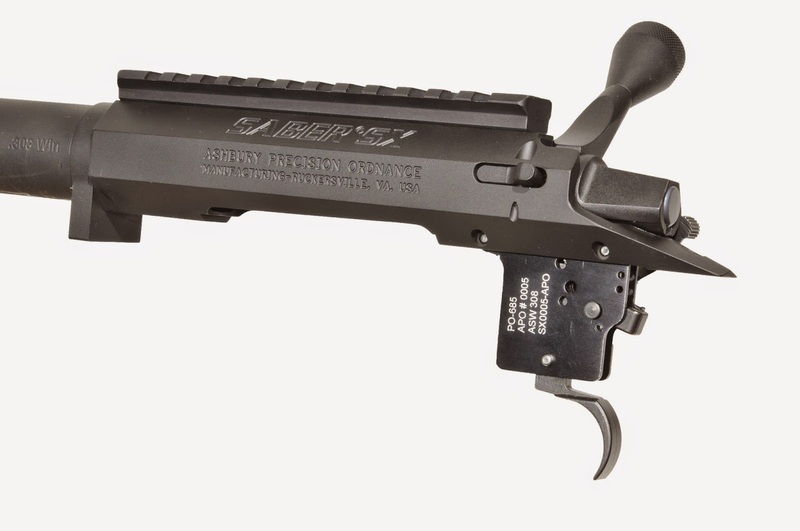 Ruckersville, VA. - Ashbury Precision Ordnance Manufacturing introduces the new SABER® SX bolt action receiver, a newly engineered manufacturing collaboration with Stiller Precision Firearms. This production short action receiver is precision crafted from 416R stainless steel and takes advantage of unique octagonal geometry to increase rigidity, reduce vibration and increase strength with a larger body diameter. The SX and other new SABER bolt action receivers are purpose built to maximize surface contact with Ashbury's newest interlocking SABER®-FORSST® Modular Rifle Chassis Systems (MRCS) requiring absolutely no bedding, yet can also be bedded in traditional rifle stocks. The SABER SX receiver is manufactured with .384" (.223Rem/.300BLK), .480" (.308) and .540" (WSM/SAUM) bolt faces, in both right and left hand configurations. APO's Custom Shop will be offering actions and other custom calibers on the SX for varmint, big game hunting, and competition shooting. The SX receivers precise OD to ID concentricity is less than 0.0002 inches and is perpendicular to the true centerline of the bore with perfectly flat mounting surfaces. The SX bolt face, lugs, internal lug abutments, barrel tenon and receiver face are all also precision CNC machined perpendicular to the center line of the bore. The receiver bolt raceway is wire EDM cut for smooth bolt operation and consistent shot-to-shot rifle accuracy. 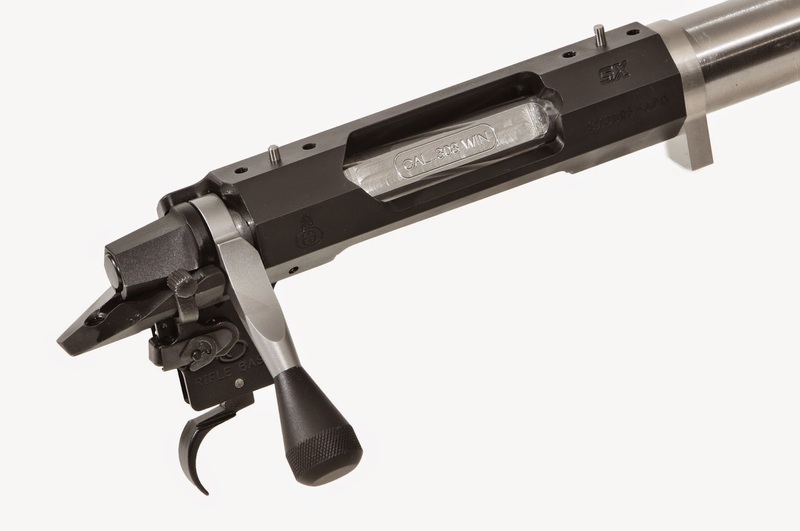 The SX receiver features dual recoil pins that center mount a removable MIL-STD 1913 20 MOA one-piece Picatinny monolithic or short receiver rail using aviation grade #8-40 anti-vibration fasteners. The strong one piece fluted bolt is made from 4140 tool steel, employs a two lug design, plunger type ejector, strong reliable claw type extractor and sculpted aerospace grade aluminum bolt shroud. 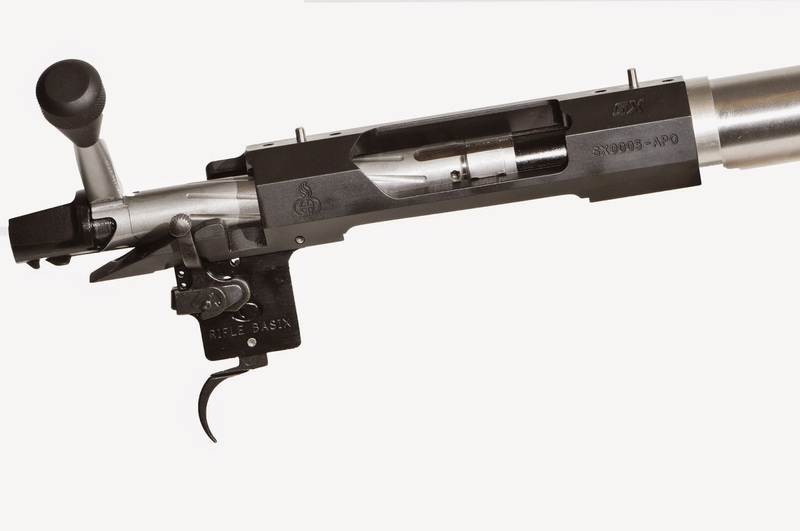 The SX further incorporates a side roll pin mounted bolt release, tang relief cut for a thumb lever safety and a spacious ejection port allows positive extraction of long loaded, unfired short magnum cartridges. SX receivers can use popular single and two stage M700 style triggers pinned directly into the precision cut trigger slot. The SX is engineered to accommodate both the double stack single feed (DSSF) and double stack double feed (DSDF) magazines, while maximizing lower receiver strength. The SABER SX bolt action receiver weighs in at 28.8 ozs with the receiver scope rail and is finished with a black oxide coating. The bolt is nitrided to provide years of smooth operation and final finishes on APO rifles use Cerakote Micro Slick. "SABER bolt action receivers represent higher quality at a lower cost and are an integral part of our spiral development engineering plan for APO precision rifles," said Gary Vance, Ashbury's Manager of Engineering Services. "SX receivers begin the next generation of high performance precision rifles and launch APO's new SABER Precision Rifle (SPR) product line." For more information on the family of SABER bolt action receivers, SABER-FORSST Modular Rifle Chassis Systems, and APO's complete line of precision long range rifles and shooting support equipment, please visit the Ashbury Precision Ordnance Mfg website, contact our customer service department or shop the APO online store, The Armory.